For Team AR Navigation Supplies the Ocean Blue adventure race is a must do event more so this year as we were the defending champions. This year I would be racing with two new teammates that IÕd only met briefly before. IÕd installed a brand new Wind Paddle sail the week before. We hoped this would help us keep Team Aquan in sight as IÕd heard they had recruited Sean Morely, the 2007 Masters Kayak World Champion for the weekend. We set all our gear up in the TA and got to know each other. The new team members were Melissa Griffiths and Tim Kuenster both from the Racing with Giants team. They had both been to PQ a few weeks earlier racing on different teams and were very experienced expedition racers. We started the race with a 1/2 mile run down the beach to round a flag before returning to the harbor and the kayak section. We had a good start and rounded the flag as one of the lead teams but slowly dropped to third place on the run back to the harbor behind Baarbd Wire and RWG. We jumped into the boat and took the long route around the outside of the fishing boats as the teams in front of us took the shortcut under the piers. The shortcut is about 10-20 seconds faster but its way too tight to get the big triple through without a few scrapes on the pylons. About half way across the harbor we were overtaken by team Aquan. They were paddling very fast and all 3 had obviously taken one of SeanÕs forward stroke classes as they had what looked to me like perfect form. It was going to be hard to keep them in sight for the next 6 miles of the Ocean paddle. We were all aiming at the breakwater and the portage across the beach to the open ocean and Mavericks waves. We had perfectly clear skyÕs and there wasnÕt even a slight breeze as we made the beach which made the use of our new sail a waste of time. As we portaged across the beach we were in 4th place and entered Mavericks with the usual excitement. But! In all the years of doing this event IÕd never seen it this calm. There was barely a ripple out there and I could even see the first buoy almost immediately, which IÕd never been able to do before. WhereÕs the fog and the huge waves we were used to? We passed team Baarbd Wire and were running parallel to Aquan on the way to the first turn. For some reason they started to zig zag wildly and we could see Thomas at the back of their boat using his paddle as a rudder. Somehow they had completely lost their rudder after the portage across the beach. This was going to be interesting to watch but it still didnÕt seem to slow them down much. We set a steady pace and just tried to keep them in sight for this almost flat paddle compared to previous editions of the race. As we returned to the harbor we were in 3rd place behind Aquan who had about 10 minutes lead on us and RWG who had about 3 minutes. Both teams were gone when we arrived in the TA to pick up out bikes. We would be chasing them on the road section to CP 2. I swapped the map from the kayak to the bike map holder and we set off in pursuit of the lead teams. We had a fairly free run on the bike path without meeting much holiday traffic and after a couple of miles I had the lead teams in sight. By this time we had a 3 person bike tow going and were moving fast. We came up behind Aquan and RWG on a fairly straight section of the bike path and didnÕt even pause as we came by. All I heard was Òwhat the! !Ó from one of the teams as we took off looking for the waypoint to cross hwy 1. Team RWG with Hani towing John jumped on the back of our train to draft us. We all found the waypoint together and made it across the highway onto the quieter roads out to CP 2. As we settled into the pace line RWG started to drop off the back of the group and we now had the race lead. All we had to do was keep it! We extended our lead on the climb and arrived at the TA with a couple of minutes lead. We were given a trail map and needed to copy the next 3 CPÕs from a master map posted on a board. CP 5 was mandatory but 3 & 4 were both optional but had very high point values. We made the decision that we would be going for all the CPÕs at this early stage in the race. If we needed to drop points we would leave it till later. CP 2 was about a mile up one of the canyons well off the trail. We had agreed that we would run the flats and down hills but would walk the climbs. This was a little different to the teams usual pace as Mari, Andy or Mike would normally run these climbs with me on the tow. This was far more social, we had time to chat and I got to hear some first hand stories from PQ Montana. We hit the CP spot on without much searching and turned around to head back to find CPÕs 3 & 4 that were 4 miles in the other direction. We had been running back down the hill for a couple of minutes when we came across RWG with Aquan another couple of minutes behind them. We were looking out for Baarbd Wire as they were a strong biking team. I was sure they wouldnÕt be far behind us after the first bike section but they were nowhere to be found. We assumed they had gone for CP 4 first.. We met them coming back down the hill from CP 3 that was about ½ a mile further up the trail. 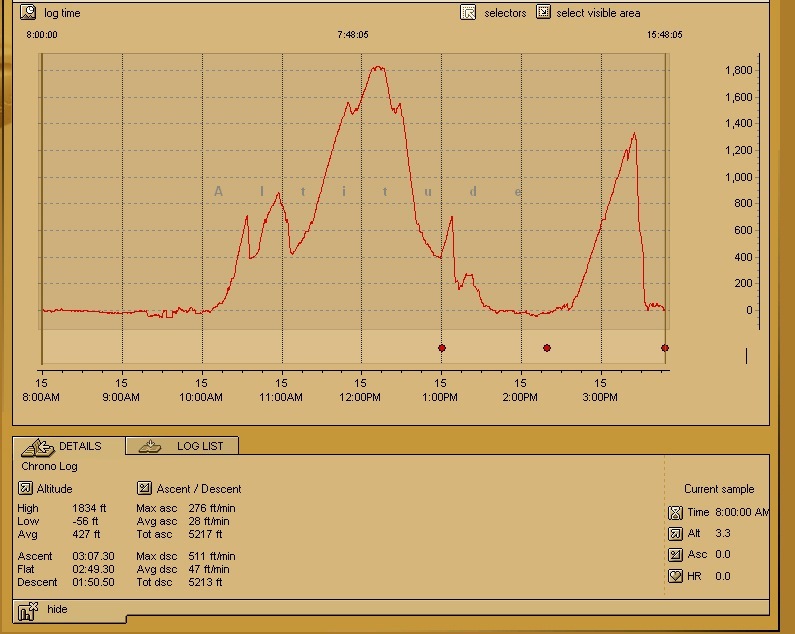 We did the math and figured out that they still had the mile of out and back to CP 5 to do and we only had ½ a mile out and back to get CP 3 so at this point in the race we were still about a mile ahead of them. We raced back down the hill to get the bikes and start making our way back to the main TA. It seemed like some of the teams had decided to skip some CPÕs as we didnÕt see any other teams on the way down from CPÕs 3 & 4. We collected CP 6 on the way, which was a simple out and back on a gravel road. As we came back into town we came flying around a tight corner with the 3 person tow in full flight when we came across a couple of tourists out for a Saturday morning ride. I swerved to miss them along with Melissa who was right behind me but Tim slowed a bit too suddenly as his bike swung around the corner on the tow rope. Suddenly there was a loud twang as MelissaÕs towline snapped. We both apologized to the tourists and when we looked back we saw Tim slumped over his bars obviously in pain. I thought something had pinged back and hit him in the nuts by the way he looked. It turned out that he had suddenly got a very bad cramp in his calf when he put his foot down and was waiting for it to go away. Lucky! We arrived back at the main TA and reloaded our packs with food and water. We were given the instructions for CP 7, which was another mandatory CP along the beach from the earlier kayak portage. Just as we were leaving the TA we saw Baarbd Wire coming in. Tim chatted with them briefly and came back telling us that theyÕd got all the CPÕs up to this point. It looked like they were only a few minutes behind us so this was going to be close. We raced around the harbor and out to the beach to find a metal stake stuck in the sand. The team volunteered me as the one who had to run along the beach in my bike shoes to get the CP. We need to find the word written on the top of the stake, which should have been obvious as it was Mavericks. I think that was the hardest part of the race. I was running in soft sand in cycling shoes, while trying to eat a banana. Really not a good combination and the people hanging out on the beach must have thought I was completely nuts. We had 4 more CPÕs to get and they were all close to the top of Montara Mountain but to get there we needed to ride up the coast into a strong headwind. Where the hell was this wind when we needed it this morning? We hit Airport Road with our 3 person tow rope and it was all I could do to keep us moving forward and not get blown back down the road. It was a slow ride but we still managed to overtake one team on the way out there. As we arrived at the park we could see a group ahead of us that turned out to be the all girl Vander Kitten Team. We chatted for a bit as we climbed the first part of the mountain but and then we were on our own for the bike push up the last mile to the top. Just as we were getting there team Baarbd Wire and RWG were coming down the hill towards us!! They had already got both mandatory CPÕs and were on their way back to the finish. We figured they still had to get CP 7 but this was going to be really close. The hill was too steep to ride so we had to push our bikes all the way to the top. Once weÕd got the final mandatory CPÕs we realized that we didnÕt have time to get the last 2 optional CPÕs and we figured that no one else would have got them either. We turned around and I plotted the shortest route back to the finish line which basically took us straight down the mountain and out to the road. Once we were on the road we hooked up the towlines again and started hammering back to Half Moon Bay. There were a couple of small hills to get over on the early section of the road but after that it was gently downhill with a tail wind. I put my head down and clicked to the biggest gear I had. I was watching the speed climb through 25 mph, 26 mph, 27mph and it was eventually hovering at 29 mph. I yelled back over the wind noise to Tim and Melissa to peddle harder and with a little extra push we hit 30 mph with our 3 person tow. A few hundred yards later we had to slow dramatically for the turn into Half Moon Bay but that was fine as we were only a few hundred yards from the finish. As we came back into the finish area Todd was giving out awards to the sprint race teams and I heard him announce that it looked like the long course winners were just coming in! I couldnÕt see any of the other teams in the finish area so it looked like weÕd pulled of the win. We ran across the finish line and handed in out passport to have the points totaled. No other teams had come in with more points than us up to this point. We had 12 minutes in hand and now we waited to see who made it back before the 4 PM cutoff. Every minute after 4 PM would be a 10 point deduction. WeÕd seen a number of teams still heading to Montara Mountain as we were on our way back so we knew that there were going to be some people with negative points by the time this was all over. I was watching the clock and with 2 minutes to go Team Baarbd Wire came across the finish line. WeÕd beaten them on time but we didnÕt know if weÕd managed to beat them on points. Had they got more than us? It turned out they hadnÕt gotten CP 6 as we had earlier thought! Somehow there had been a misunderstanding when Tim talked to them earlier and all this time we had been 10 points ahead! We had won the overall and it was now time to relax and watch the other teams roll in while we enjoyed ToddÕs BBQ and cold drinks. From what I understand this was Tim and MelissaÕs first overall win at an AR event, which made it very satisfying, especially as AR Navigation Supplies had now won two years in a row. As always IÕm looking forward to the next event in the Big Blue series. Thanks to Brunton, INOV-8, Ritchey, Magura and Ellsworth for providing AR Nav Supplies with the best gear for Adventure Racing, and a big thanks to Racing with Giants for letting me race with them.